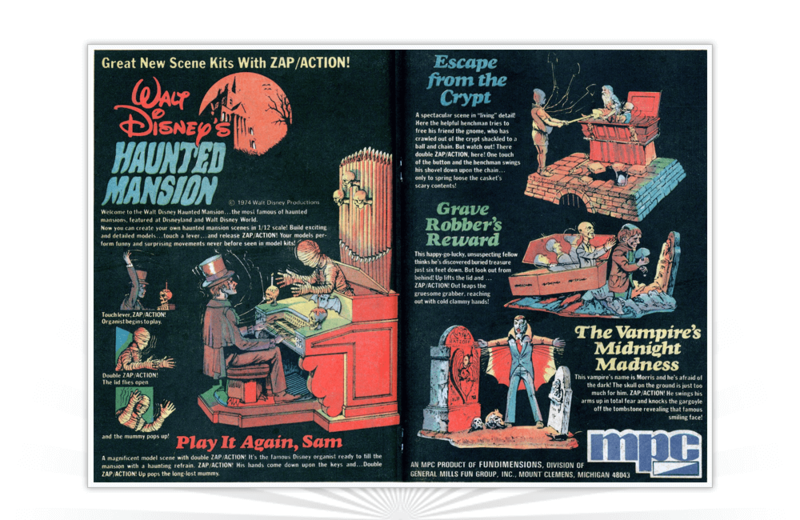 In 1974, Model Products Corporation (MPC) released four model kits loosely based on the popular Haunted Mansion attraction at Walt Disney’s Disneyland and Magic Kingdom theme parks. Each kit consisted of a detailed scene and also a feature called “ZAP/ACTION!”, a lever/rubber band system that added movement and an element of surprise to the model building mix. For example, in the Haunted Mansion model kit, touching the lever would result in the organist starting to play his instrument AND a mummy to suddenly pop out of it. Double ZAP/ACTION!! Released in 1993 by Milton Bradley, Maniac Mouse was a dexterity game for children ages 4 and up. "Watch out for the ghosts!"